A blog reader wrote to me inquiring about modifying the X-Boat Station to include additional research, observation, repair and maintenance, and traffic control spaces as well as armaments, and asked about the possibility of adding a ring around the station for those purposes. While it would be possible to design such a ring, I would be concerned that a ring might interfere with ship docking, and suggest the above images as a possible variant. This design adds a 100 dton mass to the bottom of the station and assumes the elevator and ladder run through the central fuel storage to access the new lower decks. 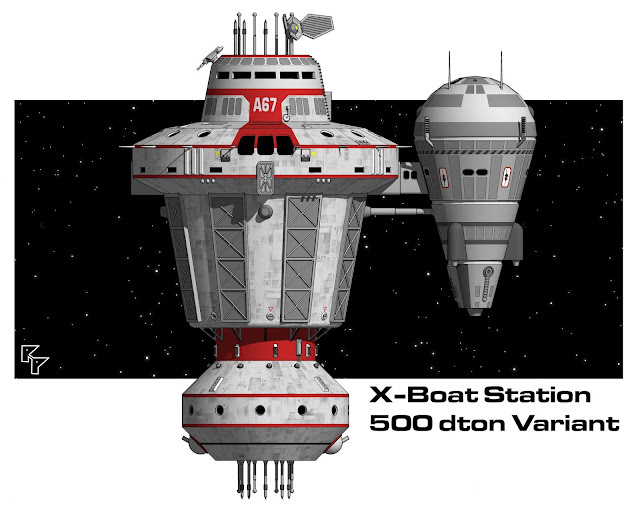 With the overall station now being 500 dtons, some of that space would need to be used for additional drive, power plant, and fuel to maintain the original station specifications. Alternately - and depending upon the gamer's intended use - the additional drive and fuel requirements could be ignored and argued that the station maneuvers at less than 1G. The new mass consists of four standard height decks (10' or 3m) with two rotating turrets and sensors projecting from the bottom. A third rotating turret has been added to the upper portion of the structure to take advantage of the three allowable "hardpoints" (IMTU hardpoints do not have to be fixed, but can be set upon tracks for better coverage). 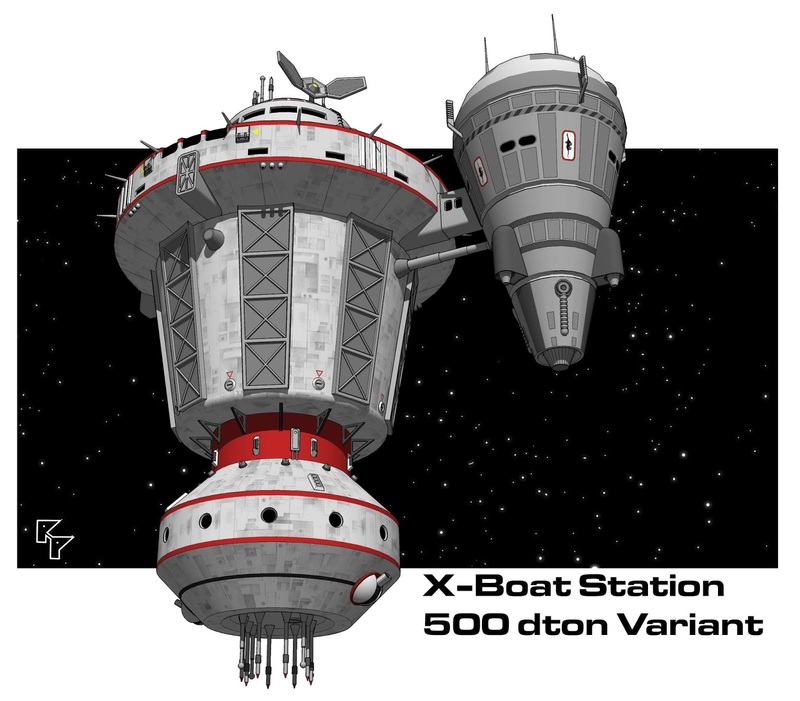 With the extra tonnage, the station can start to move away from being strictly for X-Boat usage and could become a general multi-purpose space station, albeit a pretty small one. Other uses are as varied as your imagination: a noble's off planet getaway, a research station, a manned interdiction satellite, a small trading post...whatever you want. Enjoy! Prior to this edit the original X-boat station was incorrectly shown as 200 tons, when it is in fact 400 tons, which would make this variant 500 tons. The images here and the PDF in the original post have been updated. Click here to see the original X-Boat Station post, including deckplans. Why not simply 'fip' or 'mirror' the main decks of the station? That way you double the docking points along with adding your hard points. Adjust the fuel tankage to be a simple cylinder and Bob's your Uncle, Fanny's your Aunt away you go? I like this design, but just a few questions and suggestions. I assume the X-Boat tug would dock at one of the other ports, since the X-Boats don't have a maneuver drive to be able to dock with the station. Back to the original deck plans, I would rotate the upper ring by 45 degrees, so that when all four docks are used, the Lounge is not looking at the hull of an X-Boat. I would also move the Repair Bay down to Deck 1, so that items repaired for the X-Boats don't have to be hauled 180 degrees around the ring of Deck 2, into the lift and then to an airlock. If it exchanged places with the first two Staterooms, clockwise from the 12:00 airlock on Deck 1, then you would never have to haul more than around about 135 degrees on one deck. Where does the Fuel Cutter dock? We need to have a ship bay big enough to hold a fueling cutter and two tugs, enough to move around the X-Boats to dock and pull them off, and to move the station as needed. And, I can see a larger station in the 800-1000 dton range with six docking ports and enough space for a decent area for entertainment and exercise (the current one lacks a gym and such). Also, include a single secure safe/locked area for high-value, low mass/volume cargo and the armory. Do you have a deck plan for this variant? Unfortunately, no. Because the new decks had no specific use I didn't create deck plans. I'll put creating a couple deck plan options on my To Do list.